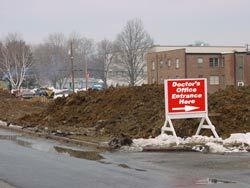 Outdoor Signs and Banners are subject to the elements and need to be made to withstand the seasonal changes. Therefore it is vital that you specify how your sign or banner will be used. 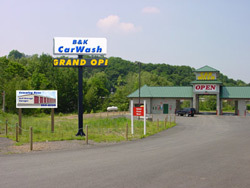 The Outdoor Sign to your right was made from Green Treated lumber. It has an aluminum core with red and white text over lay. We used our large format printer for the new construction Outdoor Signs and Banners to capture graphic detail. We printed with U.V. resistant inks on pressure sensitive outdoor media. Then we laminated with a U.V. resistant polycarbonate for extra protection. We used thirty six inch raised letters on the building. The smaller red and white directional signs we made with .060 aluminum and cut vinyl letters. The "Open" banner measures 5 feet by 20 feet! 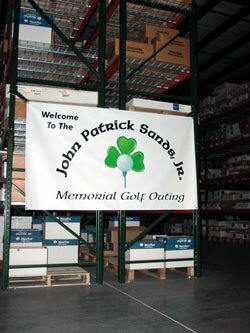 Shown to the right is a four foot by seven foot golf outing banner. The vinyl is designed to withstand the elements and may be used year after year as there is no distinctive date on the Banner. Give me a call or email me with your questions. (717) 379-4555 It will be nice to meet you. Shown to the right is a versatile banner. 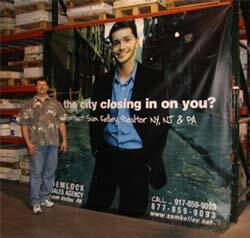 This banner was designed as a Tradeshow Display backdrop. Because of its composition, it may also be used as an Outdoor Banner. The Banner measures ten feet tall by ten feet high. Used in conjunction with Retractable Banner Stands, this is an easy way to set up at a tradeshow.